Virginia Senator George Allen claimed it was a "mistake" when he called an employee of his Democratic foe a racist name. But the leader of America's top racist group explains Allen's long and cozy history with white supremacists. 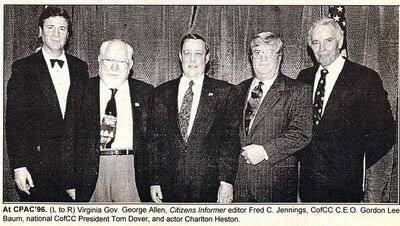 This photo, published in the Summer 1996 edition of the Citizens Informer, the newsletter of the white supremacist Council of Conservative Citizens, shows George Allen, left, and actor Charlton Heston, right, posing with Gordon Lee Baum and two associates. But was it an isolated “mistake”? Only a decade ago, as governor of Virginia, Allen personally initiated an association with the Council of Conservative Citizens (CCC), the successor organization to the segregationist White Citizens Council and among the largest white supremacist groups. In 1996, when Governor Allen entered the Washington Hilton Hotel to attend the Conservative Political Action Conference, an annual gathering of conservative movement organizations, he strode to a booth at the entrance of the exhibition hall festooned with two large Confederate flags–a booth operated by the CCC, at the time a co-sponsor of CPAC. After speaking with CCC founder and former White Citizens Council organizer Gordon Lee Baum and two of his cohorts, Allen suggested that they pose for a photograph with then-National Rifle Association spokesman and actor Charlton Heston. The photo appeared in the Summer 1996 issue of the CCC’s newsletter, the Citizens Informer. According to Baum, Allen had not naively stumbled into a chance meeting with unfamiliar people. He knew exactly who and what the CCC was about and, from Baum’s point of view, was engaged in a straightforward political transaction. “It helped us as much as it helped him,” Baum told me. “We got our bona fides.” And so did Allen. Asked whether Allen supports or deplores the CCC, John Reid, his communications director, pleaded ignorance. “I am unaware of the group you mention or their agenda and because we have no record of the Senator having involvement with them I cannot offer you any opinion on them,” Reid told me in an e-mail response. In posing for a picture that he knew the CCC would use to promote itself and him, and would be circulated to true believers, Allen joined a tradition of conservative Southern politicians seeking to burnish their neo-Confederate credentials. In 2003, former Republican National Committee chairman and Mississippi Governor Haley Barbour took a photograph with revelers at the CCC’s “Blackhawk Rally,” a fundraising event for white “private academies.” In the subsequent hailstorm of media criticism, after reporters discovered that the CCC had posted photos of Barbour on its website, Barbour pointedly refused to demand that the group remove them. Though Barbour came from an old and influential Mississippi family in Yazoo, he had spent a long time as a lobbyist in Washington. “In Mississippi, one of the biggest problems he had was they thought he [Barbour] was a scalawag. So it didn’t hurt him in Mississippi,” Baum said of the photos. “Nobody said, ‘Oh my golly! '” Despite the CCC photos becoming a campaign issue, or partly perhaps because of it, Barbour handily won re-election in 2003. Later that year, Garnett closed the Virginia Council on Day Care after accusing it, as he wrote in a letter to Governor Allen, of attempting to “form the minds of our young children with a radical ideology before they enter public schools.” The Virginia Council had aroused Garnett’s ire, according to the Virginian-Pilot newspaper, for preparing an “anti-bias” curriculum for daycare teachers. Allen approved the shut-down. The year after his letter to the SCV, Allen issued a proclamation, drafted by the local SCV, declaring April as Confederate History and Heritage Month–the month Fort Sumter was attacked and Lincoln assassinated. Once again, Allen’s proclamation was laced with neo-Confederate ideology, describing the Civil War as “a four-year struggle for independence and sovereign rights.” He avoided any mention of slavery. Days after Allen’s proclamation, the SCV celebrated at the US Capitol. The featured speaker was Richard T. Hines, an influential Republican lobbyist and neo-Confederate financier who, a year earlier, had protested the erection of a memorial to black tennis star Arthur Ashe in downtown Richmond, Virginia as “an attempt to debunk our heritage.” The NAACP condemned Allen’s SCV-inspired proclamation, while Confederate Memorial Association President John Edward Hurley called the SCV’s celebration at the Capitol one of “the worst capitulations to white supremacy” since the Ku Klux Klan marched down Pennsylvania Avenue in 1920. When asked whether Allen supports or deplores the SCV, his communications director Reid replied in an e-mail, “Governors routinely send greetings to individuals and organizations and that is what the constituent service office did in this case. I am certain you will note the inclusive language in the letter advocating ‘a rebirth of freedom for all Americans. '” As with the CCC, Reid did not offer any condemnation of the SCV. In the wake of Lott’s fall, Allen dramatically pronounced the end of institutional racism. “This is a day that the United States Senate, with Trent Lott’s resignation, has buried, graveyard-dead-and-gone, the days of discrimination and segregation,” he proclaimed. With discrimination “graveyard-dead,” Allen clearly hoped questions about his own past would be buried as well. In 2000, he had hung a noose at his law office. When that fact was reported, he claimed it had “nothing to do with lynching.” When it was reported that he also hung large Confederate flags in his house, he explained they were part of his flag collection. Allen had also opposed the 1991 Civil Rights Act and making Martin Luther King, Jr.’s birthday a holiday. But the goodwill Allen may have earned with his image makeover evaporated on August 11 in Breaks, Virginia, a rural town deep in the heart of Appalachia. Before an all-white crowd, he called S.R. Sidarth “Macaca, or whatever his name is.” When Allen asked the crowd to “welcome Macaca here” to “America and the real world of Virginia,” his audience hooted and hollered. Below the media’s radar–and away from every camera except the one in Sidarth’s palm–Allen was raising a supposedly buried but still vibrant racially charge populism. Now Allen finds himself in a quandary. While he atones for his racist gaffe in order to succeed in the 2008 Republican primaries, he cannot afford to alienate the neo-Confederate movement that helped propelled his career during the 1990s. As Allen begs forgiveness for his “mistake,” his spokesman avoids criticizing groups like the SCV and CCC. “The neo-Confederates could break a Republican candidate, especially in South Carolina, where they’re extremely organized,” Sebesta observes. Senator John McCain’s misadventure with the neo-Confederate movement in the 2000 South Carolina primary provides a cautionary tale that must not be lost on Allen. Facing George W. Bush in South Carolina, McCain hired Richard Quinn as his state field manager. Quinn was an editor of the neo-Confederate magazine Southern Partisan, and a frequent critic of Martin Luther King Jr. and Nelson Mandela, who he once dubbed a “terrorist.” Before the primary, Quinn organized a rally of 6,000 people in support of flying the Confederate flag over the statehouse. Quinn dressed up McCain volunteers in Confederate Army uniforms as they passed fliers to the demonstrators assuring them that McCain supported the Confederate flag. As soon as news spread that McCain had called for removal of the Dixie flag from the statehouse, the SCV’s Richard T. Hines funded the distribution of 250,000 fliers accusing McCain of “changing his tune” and describing Bush as “the [only] major candidate who refused to call the Confederate flag a racist symbol.” Bush surged ahead of McCain and took South Carolina, dooming McCain’s presidential hopes. Now, Allen is trying to lay the groundwork for his own Southern Strategy in 2008. On August 9, he took time out of his re-election campaign to keynote the South Carolina GOP’s state convention. If he can overcome the controversies over his past in his Senate race, Allen may yet get to play his old game once again.